I crossed the frontier after having several kilometres in ascent, from Czech Republic, and at once I was received by three boys with a very spontaneous smile. And I didn’t make a mistake; this was the sign that I would be treated better here, that the Polish would not be as the Czechs. Although physically they look alike, the Polish are also blond and with blue eyes, but they are not as tall as the Czech, but shorter and a little more well-built. The first kilometres leaving the frontier were the hardest in the whole country, some terrible ascents that take out all my strength, at the end of it, I finished stopping every 2 km to rest, I needed to eat something, but it didn’t take anything, neither I found any place to eat. It took me two days to arrive at Wroclaw, a fairly important city in the south and although it is not a tourist city due to my economic situation, because of the Czech, I stopped in the afternoon to sell some of my dolls. At once I went to a student hostel and it was really cheap to eat there, I finished eating three dishes. Then I went to the central square where the cathedral is, one of the places with a lot of movement in the city. And it was not bad for me, although I sold them cheaper than ever, I got the money to continue my trip to the capital city, Warsaw. The Polish were near me and when they knew I was Argentinean, they bought dolls to help me. An elder man told me that he had a cousin in Argentina, and that he had left the country when the German occupation took place. And he was not the only one, in my journey through the country, there were a lot of people that told me that they had some relatives in Argentina, but I only knew that there was a Polish Community in the South of Argentina but not exactly where it is. I don’t know if for this reason, for the fanaticism of the Argentinean soccer or for whatever reason, but the Polish were always nice people with me, very kind and curious, they came near to chat or to know if I needed something. It was in this way that in Wroclaw, under the threat of a heavy rain in the evening, a boy offered me to sleep in his house, but after the storm I preferred to face the route again and to camp alone, in the field, like I really love. The horizon promised a very good night. 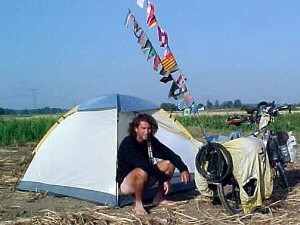 After one hour of pedalling and at some kilometres from the city, I put up my tent among fields of potatoes harvested. It seemed that it will be a great night, of those that are several fleeting stars, with clear sky, without moon and under the immensity of thousands of stars. But what a surprise!. When I tried to start eating I realized that I had lost the gruyere cheese I had bought for my sandwiches. I finished eating only some bread, a couple of bananas and some cookies. But I didn’t care, the night compensated it all. It took me three days more to arrive in Warsaw, almost always among some rain or storms that delayed me. It rained in an unusual way in Europe this year, much more than last year. There were a lot of people who told me in every country I was crossing that during July and August in 2003, it didn’t rain either one day. My trip around Poland was very calm, people are very humble and they work nearly the whole day in the field; it is easy to see the smallest members of a family driving a farm- tractor or simply sweeping the overgrowths, while women milk the cows that are tied to a chain. But the days are the most extraordinary and amazing thing, because the sun doesn’t set exactly in the west or maybe it doesn’t dawn exactly in the east. 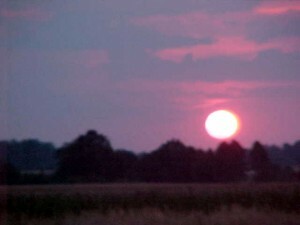 Days are longer in the European summer (it gets dark at 10 pm and it dawns before 5 o’clock am) and in this latitude (because of the inclination of the Earth) it would seem that the distance covered by dawn and dusk, is only of an angle of 120° or 130°. Finally, I arrived in Warsaw by the national route n° 8, after repairing my second European puncture; the first one had been after leaving Barcelona, more than 3.000 kilometres behind. Almost the same as in Africa; I always have those punctures in mind. Warsaw is a unique city among the European capitals. At the end of the Second World War, near 80% of its buildings had been smashed. But the city was reconstructed during the communist age, between 1945 and 1989; and it would seem that during the last years it was invaded again, although this time for the capitalism. It was the impression that I had when I entered cycling to Warsaw; at the same time I could see the communist style construction: old, big, and squares buildings and its contrast, high and luxurious towers with the name of big companies. Mobiles, computers, televisions or supermarkets. Way to the centre, a boy with his bicycle come near to me, his name was Karol and he guided me to the tourism office where I got good information to locate me and to stay. Then I went to sell my dolls, my last money had been spent in the dinner the day before and I had arrived to Warsaw without any money. So I parked my bike in the old town and I opened the map of my journey; and taking advantage of the lot of tourists, I sold to each one who looked my bike or my pictures. I had a good time with people of that place, most of them, Poles who exposed their crafts to sell too. Immediately that they saw me they came near to me to talk and they invited me with some food. I remained in Warsaw 5 days, I visited one of the local newspapers which printed an article about my trip and I also went to the Russian embassy for information. 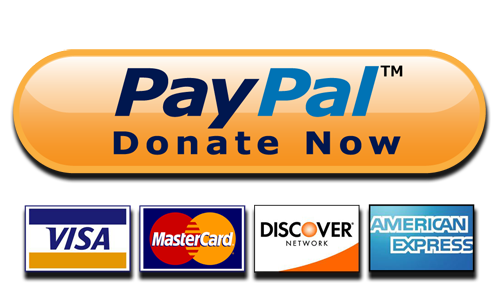 Among the requirements to get the visa I need round trip passage and the voucher of the hotel payment. It is impossible for the trip type that I come carrying out. Warsaw also has its tourist attractions, as the Real Castle, its Cathedral, its monuments or its museums, but after my experiences in Prague, I preferred to spend my days in the old town and to get some money for my trip. There the square of the market exists, it is the most beautiful place in the old town city where there are high and decorated houses of colours which were built or reformed by the rich merchants of the XVII century. 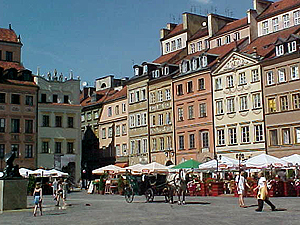 Like in others European capital cities the old town of Warsaw was declared humanity’s inheritance by the UNESCO. 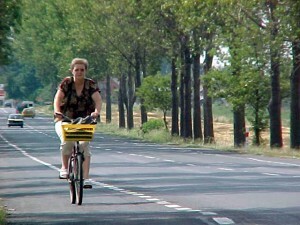 I left Warsaw on Sunday morning; Karol who was already a friend cycled with me about 70 Km. From the capital city up to the frontier exists only 330 Km and although the route is not very good, I only delayed two days to arrive there, the wind blew from the back. In the north of the country I crossed the Mazury area, called the country of the thousand lakes, too. It is a place with paradisiacal landscapes but at that time there were too many tourists. 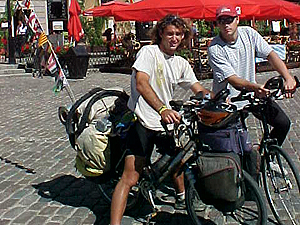 Poland was a long country to cycle and I liked it; the long distances remember me to my cycle days through Brazil, when with a lot of enthusiasm I started the trip. It was more than 5 years ago. I hope to continue going by other 5.